The past few days have been an absolute whirlwind! Remind me not to do renovations on a house anytime soon. Then again, after this one, I won't have the budget for a long, long while--ha! I have really been enjoying watching the house come together, though. I took some risks with the paint colors and so far I love the result! Can't wait to show y'all the "afters" and wax rhapsodic on Benjamin Moore colors. Without further ado, here's some more house! Continuing on the first floor, we run into an office (which I apparently forgot to photograph--just think square room with wood wainscoating on the bottom and grassy wallpaper on top) and then....the PINK bathroom. It needs no introduction. It will be a while before we can afford to update this, but in the meantime, I always like a challenge! I also think that removing the frilly "toilet hat" (for lack of a better term) will help. Then, we have the technical master bedroom, which we're using as a guest room/playroom for now. And lots of vintage details. And there you go! Stay tuned for house tour, part 3. Since I like to give my clicking fingers a rest build up the suspense, I'm all for breaking things up. So what's YOUR take on house hunting? Did you find your current home quickly, or after a long search? is melting my heart today. It's 11:45 pm, I'm tired right down to my finger-bones (is there such a thing? ), her daddy's working late, and I'm trying to decide my theory on the "crying it out" method within the next four minutes. But I turn to this photograph and think, ohhh. My sweet, sweet girl. I think of how she read books with me this afternoon, how she looked up at me with such a funny expression during tummy time, and the mischievous smile on her face when I took her out of bed earlier this evening. 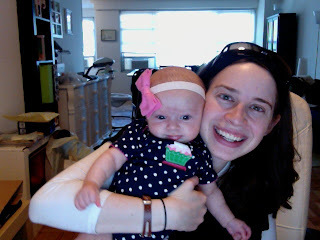 Life with her is a whirlwind, and it pretty much was from the moment she was on the scene--in utero. She has always surprised me, changed the game on me, and forced me to handle more than I thought I could. But oh, she makes the ride so sweet. What's on YOUR "sweet things" list today? I love reading house tours on blogs, so I decided to share one with you all! Mind you, these are all "before" pictures, so I'll show you what things look like before we move in! To the side of the kitchen is ye olde laundry room. Now back to the kitchen! We're hoping to extend the kitchen floor to avoid the great floor/carpet divide over here. And there's a lot of wallpaper love in this house. Serious wallpaper love. One of the first things I'm hoping to do in the house is change up the window treatments. A lot of the ones currently installed tend to block out light, where I'm a big fan of letting the natural light stream in! Any and all advice on window treatments is much appreciated! I'm trying to choose a paint color for this area, but need something light since it's a darker area. Anyone have a soft beige/sand/gray color they love? That's part 1--stay tuned for more house tour photos! And since I'm a sucker for a good house tour, feel free to link up if you have one posted! Tell me, do YOU share my love of house tours? Any House Hunters fans out there? It's a new month (or at least, 7 days or so into a new month?) and time for a new Write. Click. Scrapbook gallery! The theme this month was "everydaily" so I decided to record a very everyday occurrence in the Starr household--Ellie's stretching. When I was pregnant, I would often feel this weird sensation as a little limb not-quite-kicked, but still determinedly stretched against my belly. As soon as E was born, I realized what had been going on in there: lots and lots of stretching. Girl likes to stretch when she wakes up in the morning, after a 5 minute nap, and anytime she finds herself on her changing table. I had fun whipping up this layout to document the stretching-good times! I used my April Studio Calico kit for this one and added some nibs from my stash. I also decided to get on board with the hand-cut arrows trend. This layout was just calling for them! For the photo, I used a professional shot by our awesome photographer, Rina. Go check out the rest of the gallery right here! In other scrappy news, I've held out for a while, but it's happened--I'm starting to want a Cameo. I've been resisting because (a) I don't love gadgets, (2) it's a lot of work to learn how to use a new tool, and (3) it's a lot of money for a fad. What's winning me over are the scripty titles and dreamy quatrefoil cutouts. What do YOU think? Is a Cameo worth the money or not? These days, life is busy. A little too nutty for my tastes, but I hope it'll calm down soon. ...and she's starting to look around all the time. She actually watches and plays with the toys in her playyard now, which is crazy! These days, life has been one heck of a balancing act, but I'm so happy to have so many wonderful things to balance. 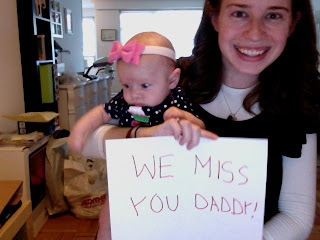 And so so so very happy that Shabbos is less than 24 hours away. Tell me, what is YOUR best and worst thing these days? How do YOU balance your commitments? Check back soon for my Write Click Scrapbook project for May!